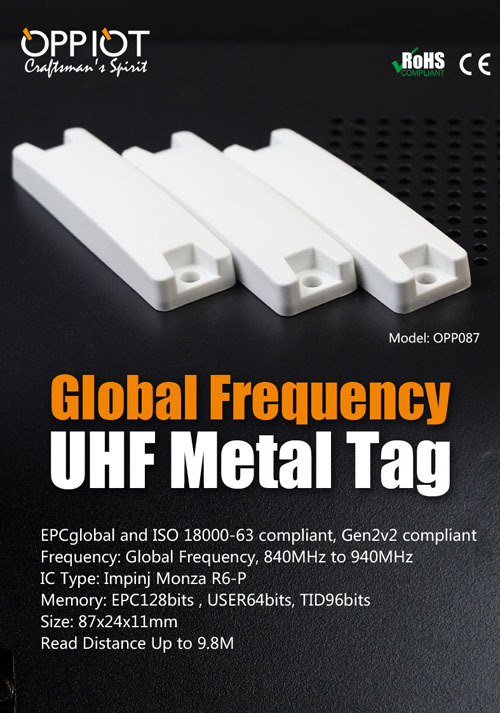 "OPPIOT is an leading industrial tag manufacturer in China,we concentrate on RFID tags for harsh working environment.Our team do researching on marketing demand and study on UHF technique since 2013,products we design&launched are considered to meet the market's trend and performance is the maximum. Our industrial solutions are build to operate under extreme industrial conditions reliably,but to improve machine up time, faster throughput time, increased safety and reduced service costs. For convenient inventory control for global enterprise,we designed Long reading range RFID tag OPP087,size 87*24*11mm,that is global frequency(840-960MHZ),with ABS outer case which could be workable for outdoor with life cycle is 6-10 years,reading distance could be up to 10 meters.Options for mounting method is 3M adhesive and by screw. We use leading brand equipment to verify performance consistency for each shipment “ Voyantic Tagsurance”.R&D is our best,we take challenge for customized projects.